For some, travelling is exciting, adventurous, meaningful, and life-changing. For some of us, it sounds really cool, but also really expensive. There are many travel apps out there to help you plan an amazing trip, even apps that can be adjusted to ones who are financially sensitive. However, there isn't anything that takes account the essence and the purpose of travelling, while also considering the total cost. 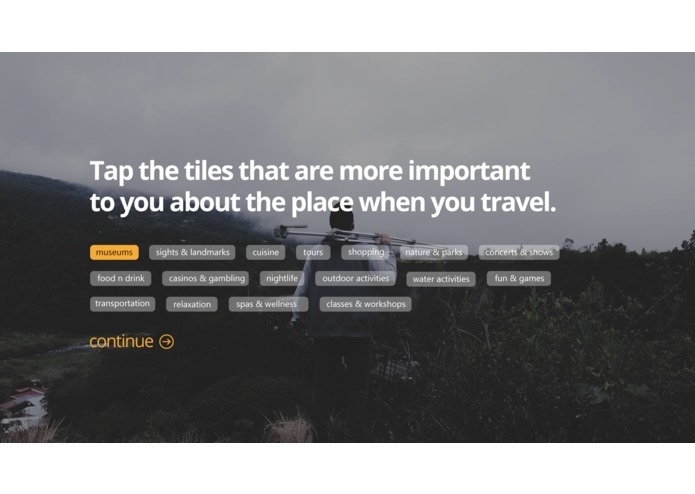 These existing travel apps would require you to turn on your handy calculator, or an excel sheet to keep track of the total spending on the side, and we have an application that calculates your expense for you. 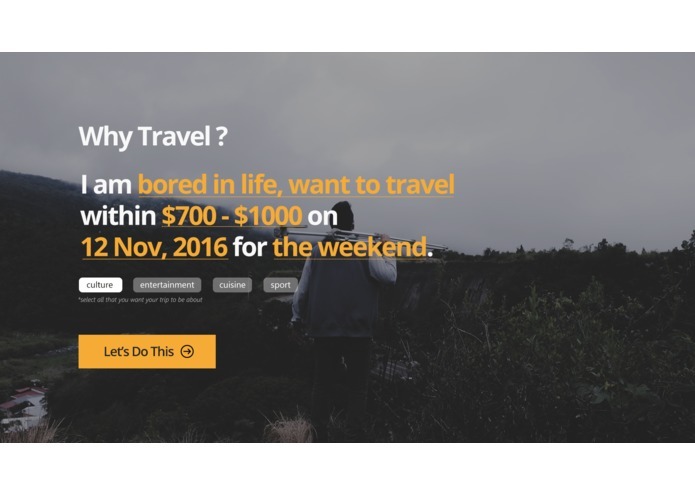 OkTataBye is a web application, and we aim to capture individual reasons for travelling, preference in activities, and budget for the entire trip. 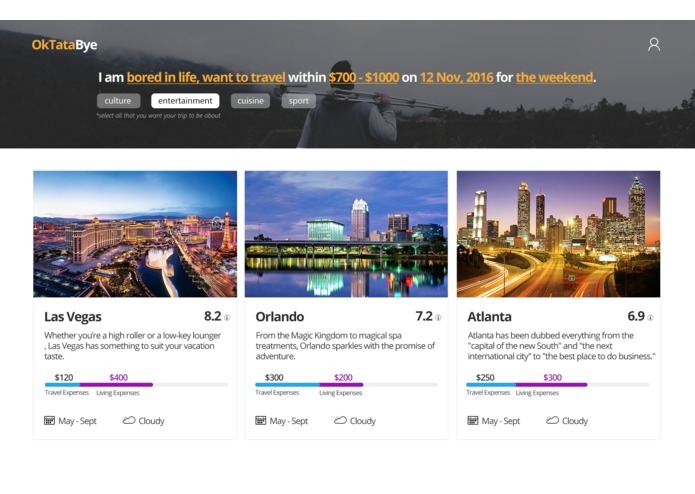 In the end, it will display different places around the world where you can travel with flight and lodging information, and visually represent how much you have left for the activities you want to enjoy (e.g. food, religion, hiking, etc. ), which the site will also display by its ranking. Because each trip is very individualized and user focused, we prioritized our effort in the flow of the process. We first identified the ideal users for the application, created a couple lo-fi prototypes, and used Photoshop to develop the interfaces. We will be integrating Amadeus' API via Python for flight and hotel to find the users with the most affordable flights and hotels. The API call will result in json files that will be displayed in our HTML. We are really proud of the idea and the execution using Amadeus' API calls. We all agreed that this is an app we definitely thought of, but never thought to implement without Amadeus' APIs. The process was very complex and there were so many factors to consider because of the subjectivity of travelling. 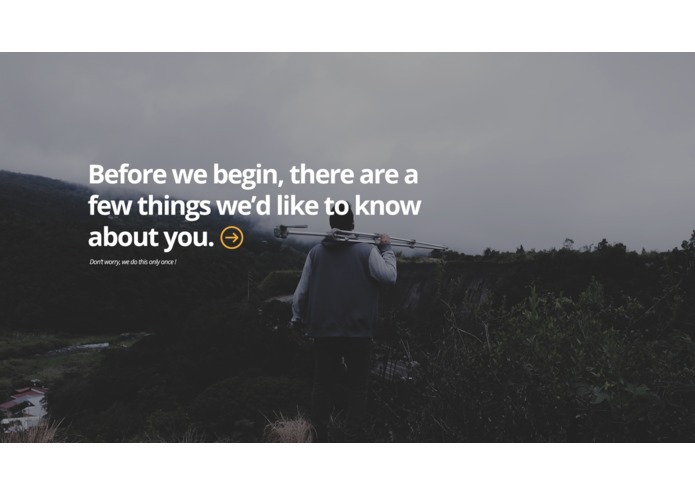 However, we believe that by having the focus on the users, we were able to create a flow to create a valuable experience even before their trips begin. We learned that planning can take quite a long time and prioritization of features is definitely critical, especially when there is a limited time. We hope to bring this into a live web application, where we'll be able to integrate more APIs to display for the users on our website. Example APIs we would like to call are: TripAdvisor, Yelp, Airbnb and Booking.com.